It is probably my favorite book that I've ever written, and arguably my best. It's not doing nearly as brilliantly as Tiger Next Door, but the reviews make me mist up happily, and I utterly loved writing it. I am taking a few moments off from building my wordcount to do a 2018 Chopping Block. It's long overdue, and has been weighing pretty heavily on me mentally. Look for that... soon, because I think it's going to feel like a pile of bricks off my brain. I am four pieces into #inktober on day two! One is a commissioned sketch (of a catbox) for a patent cut-sheet, two of them are coloring pages for the next Coloring Alaska book... which I hope to release the first week of November. This was experimenting with a Copic brushpen that I think I quite like. Original available: $15 includes all shipping. I wrote a little over a thousand words on the not-a-book this morning, and have pie-in-the-sky ideas of getting it finished this month. I hit my goal of 500 words/day last month, despite starting 10 days late, so it feels... actually possible. I also jotted down some of the ideas I have for the NEXT book, which is one I really, really want to write. There is snow in the forecast for next week. Hold me. Off to go shopping again today... because I forgot bread. Thursdaily with post-not-a-book-guilt. Also, all the #inktobers! My stupid brain. It keeps insisting that I'm slacking off, that I haven't dooooone anything today. Shut up, brain. I finished a book yesterday. Also, I finished scanning my #inktobers! Click through for a much larger version. I even chopped wood and made a fire, and vacuumed and did dishes and scooped the catbox. See, brain? Stuff a sock in it. I'm having a brownie. I... may have an ornament problem. I didn't realize I had SO many. I'm not sure how (or if) I will be able to display them all. After next weekend's show, expect to see some here for sale. A lot of them are on shatterproof balls now, and I've also successfully shipped the glass ones several times. I'm going to treat myself to an episode of Arrow and then there will be a walk with Guppy, and probably I'll start packing the car for Saturday. I have not been blogging, but for good reasons! I won #inktober! I won! I haven't had a chance to scan yet, but I will have proof soon. Many will be available for sale, but speak up quickly if you spot one you'd like. Just shy of 1000 words on my not-a-book today, and I got up early yesterday to add another 1000 to it. It's like pulling teeth, but I am determined to Get Er Done. I've got another promotional project on deck that is proving to be TREMENDOUS fun. I cannot wait to release it. I'm nailing down dates now, and will have more information about it soon. Also, I made an apple pie today. A DUTCH apple pie, which is like a regular apple pie with ice cream already injected underneath the crust. No soggy crust! All the creamy joy! So easy and delicious! Jake will be lucky if there is any left to come home to. My attendance at a tea party is now required. There are also dishes to wash, and although it is not cold out, I am considering a fire in the woodstove. A little more progress on my project I can't share, and I've finished eight #inktobers (though I still haven't spent any quality time with my scanner...). Added about a thousand words to my not-a-book today, and spackled all the holes and outlined the last four scenes. Then I polished up my summary and tweaked the cover a bit. The finishline is in sight! Guppy is starting to be interested in having friends, and today attached herself to one of the little boys at the preschool to run an ice cream stand. When others wished to be involved, she announced that "This is a PRIVATE establishment!" But she was still willing to sell them ice cream, because she's apparently a little capitalist. This is a photo where she is wearing her 'winter fashion scarf,' which was what she chose to take to preschool for show and tell. I'm working on a rather large art project that I can't share, but I'm so tickled with how it's coming along. I've made big progress this week, and the client is really happy about it. My writing is at a crawl, but progressing - the not-a-book has just topped 26k, and I may have finally worked out the sticky plot mire I was stuck in for the last few weeks. The last quarter of the book is going to need some heavy editing, but I think I've got a solution for all the problems I didn't like. Now, I just have to write the last 5 or 6k words that will wrap it up, and get it off my desk already. 600ish words today so far. I continue with #inktober, and have gotten six finished, though only the first two are scanned yet. Last night I broke out the dip pen I got in the Artsnacks box Jake surprised me with. I haven't used a dip pen in a really, really long time, so I'm rusty, but I loved it. Things to do now! Off to do them! Tuesdaily with really the last Inktober. Also, next Sketch Fest, and Kickstarter survery results. I've been continuing to clean and purge, in bits and fits, and one of those fits I found the bound copy of the Upheaval novel that I wrote for NaNo a few years back. And... it's not terrible. It's actually really GOOD in places, and I'm getting excited to start filling in some of the big gaps and fixing up the characterization. (Oh look, this character gets REALLY important in the last chapter. Maybe I should actually mention them at some previous point... and give them a name.). I got the Kickstarter surveys compiled into a document today so I could look at the trends: people felt strongly about zombies (some people wanted them, more REALLY didn't). The next most mentioned was Fantastrix, which was perfectly evenly divided between people who didn't want it (largely because they already had it!) and those that did. Most responders (by one!) didn't care what they got. It is not until February, because I am REALLY SUPER SERIOUS about taking a sanity month. I am going to put on an autoresponder, and just step away for a while and do without having to update anything or answer anything or fill orders or do customer service or help anyone reset their password. Orders have trickled away to nothing, so I'm tempted to close up a few days early. Very tempted. Fire and wood now - it's not as cold as I was hoping it would get, but it's still chilly, and I've let the fire die down. Brr! Happy solstice! It really matters up here - we're down to less than 4 hours of sun (and functionally NONE on this side of the hill), and I am more than ready to get some more of that back. I feel back on the horse, health-wise, but as many times as that's gone quickly sideways on me this fall, I'm making sure to stay hydrated and rested. This weekend I redid some of the bathroom work we did over the week - we'd accidentally buried some electricity for the lights behind finish work, and it needed to be dug out. And after Guppy got up from her nap on Saturday, I impulsively said, 'It's time to give away some things!' and we spent about three hours doing a MASSIVE room purge. She was remarkably compliant with the idea that we were giving away piles of her toys to 'girls who don't have any' and we also took the opportunity to put up some of the toys she either didn't play with yet or didn't play... er... correctly with. Puzzles, for example, were all dismantled into pieces and carried around in tote bags with crayons, cards, stamps, play jewelry, lincoln logs, and Duplos. We sorted bags and bags and bags of these miscellaneous things, and put up all the Lincoln logs and Duplos, sorted the stamps into their boxes (put up), put all the art supplies together (left down), separated out the cards (also left down, and not sorted into their games - it's just a giant stack of playing and flash cards), and her room looks marvelously clean and uncluttered. Her training potty was given away, and her diaper genie and the stroller and booster seat and all the things she doesn't use anymore. The basement looks better, too. It was followed by a necessary flurry of vacuuming, and everything is much less 'I've been busy lying on the couch praying for death' and more 'a house I wouldn't be ashamed to show people'. I have two more gifts I'd like to get mailed (already late, of course) before the season is officially over, and a few small family things to wrap. Otherwise, I'm ready for Christmas to be here! It's supposed to get COLD over the next few days (-30! ), and I'm actually really excited for that, too. As soon as Guppy is up from her nap (soon! ), we'll be going outside to stock up on wood inside and I'll start a fire. This morning's plans were derailed by a sad little "I have to throw up!" and delivery on that promise. Wednesdaily with gifts going out, and new artwork. Boxes are in my car ready to be mailed. This is the first time in years that I've mailed actual gifts, and it feels lovely. It's cold in town today, so I will probably wait until tomorrow to send them; we're going to have a lazy day in front of the fire, with one well-bundled walk to hang ornaments on the trees in the forest. We may watch Enchanted. There will undoubtedly be a tea party. Mondaily, with new artwork, #inktober and snow. The first of this week's artwork reveals! 8 were prompted through Sketch Fest, 3 more were prompted through my artist page. Wednesdaily - Much Art, Many Things, No Brains! Locals! I will be at two shows not this weekend, but next. First is PopCon, our very own little local con, here at UAF. You can find me at the Wood Center Friday, Nov 6 between 4-10(ish) and Saturday, Nov 7 between 2-9(ish). I will also, thanks to the power of being two places at once (IE: sharing a table with laylalawlor), be at the UWA bazaar Saturday and Sunday, from 9 AM-4 PM. I've approved the proofs at the printer, and it is going to be a GORGEOUS little coloring book. As it says on the label, it's a coloring book of wildflowers, 6 from me, and 6 by Layla. Layla wrote descriptions of each flower, which are included on each image. The other items we'll be unleashing on the world are hand-painted ornaments. We've been having tremendous fun painting these. I'm up to #25 for Inktober, and not at all sure I will continue. There's a limit to my energy (no, really! ), and I'm enjoying the ornaments more right now. 25 is still impressive, and I've got a lot of things crossed off my list. I think that's enough artwork for today... Monsterus Minimus appears to be on a nap strike, and I've got an ad to design and some writing that's due. I'll save the rest of my big news for tomorrow! I feel like I'm tipping distance to ALL THE THINGS right now. Seriously, I am THIS close to finishing about seven projects. I am super excited about all of them. I'm going to go do them instead of blogging about them. There is a new portrait available for adoption! I'm up to 12 for #Inktober! Three are for Portrait Adoption (2 posted already! ), 5 are for Torn World (mostly sketched during Sketch Fests), 3 have been prompted at my Facebook artists page ( https://www.facebook.com/EllenMillionArtistrix/photos/a.583430851760984.1073741838.407054896065248/745775952193139 ), and one is an overdue character portrait I promised to a friend. It's lovely both crossing things off my list and getting ahead on Inktober at the same time. At the end, maybe I'll put them together in a little chapbook or something. Our walk yesterday was very slick and slushy, and Guppy's boots over-topped with snow several times. Next time, snowpants, she agreed. Today was a lunch out with Guppy and an out of state friend (and her coworkers). Guppy was well-behaved for the most part, though I went with a sinking feeling because we had a major screaming fit shortly before we left the house. Fortunately, that passed smoothly, and there was a lot of giggling and basically being good, if slightly wiggly. I got her on a bench seat pinned in by a very tolerant lady and me, and she played quietly with her coat and the menu and nibbled at her food (once it finally came). There was room for her to lay flat on the bench while we were waiting for food and she could squirm without bothering anyone, and never got too loud. I will count it a success. I also picked up my newly modified display rack, and Cripple Creek Custom did an amazing job on it. It looks SO nice, and is so sturdy. I hate watching people shove things back in too roughly and make the whole display rock; I don't think that will ever happen again. Art and Agents of Shield now. Thursdaily with cancelled preschool and #Inktober! I have completed 3 pieces for Inktober thus far, and have just wrangled a worn out Guppy into bed and hopefully to sleep. I will be working on coloring book things for a while here, but am hoping she stays asleep long enough for me to get a little further ahead on inking, too. Given my schedule this month, a two-day lead is Not Enough. And some of the pieces I'd like to do will be multi-day affairs. Preschool was cancelled today. The roads are passable again, but big chunks of town (including the school!) were still without power. So, no tea shop and inking for me! "I'm going to make a disaster!" Guppy told me merrily, walking up the stairs. "Okay," I answered. "Have fun!" We also went outside for a while. The sun came out, but the photos I tried to take didn't capture the sparkle at all. And there was mac and cheese, and tea, and a little Max and Ruby, and princess music, and many laps around the dining room table. Also, no pants. Because... well, just because. 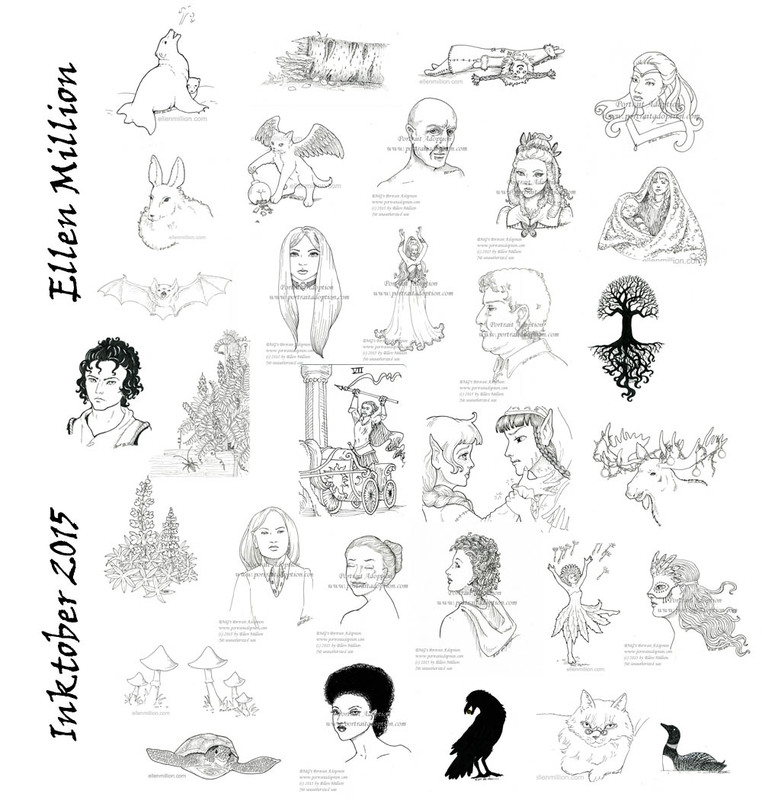 October was as nuts as September was, with a lot of coloring book work, the INKtober challenge (31 ink pieces in 31 days! ), stomach flu (not fun! ), animal illness (more not fun! ), and the true arrival of winter. Most of the originals are available - just let me know if you are interested in one! Additionally, the color version of Skykittens went up! A ridiculously complicated ACEO was posted at River Twine: Illustration for Brightwood. Sketches for Sketch Fest: 5 total for 2 Sketch Fests. I made some improvements at the Sketch Fest site - especially for product management and expiration. I also did a bit on the backend of the Lilypad and reprogrammed the coloring book ordering page. The perk for Patreon supporters was a digi stamp of my very popular Candle dragon artwork. 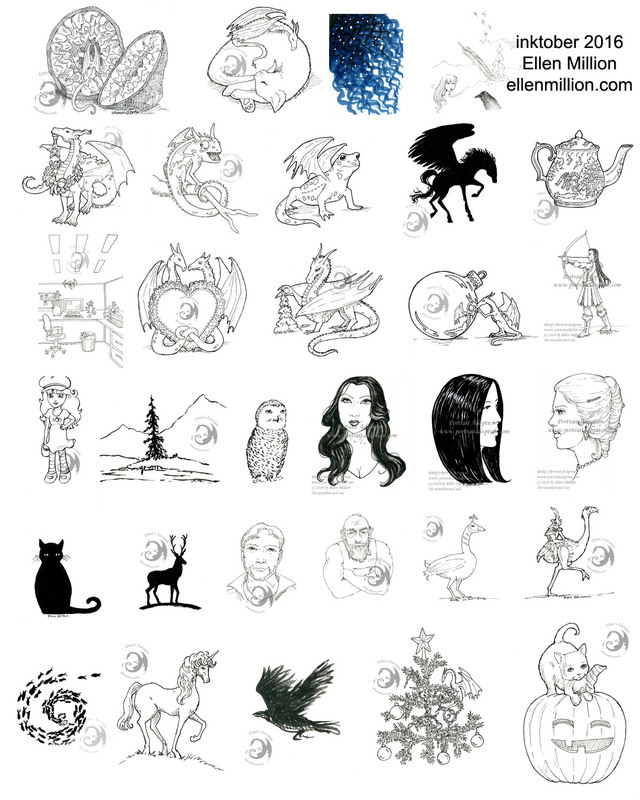 I got 11 coloring books back in print, and sent all of the PDFs out for Kickstarter patrons! This was actually a LOT of work - even the coloring books that had already been in print needed some pretty good re-formatting, and I went ahead and did some general improvements, even releasing one of them as a second edition. But they look AMAZING. I am really happy with my new printing service. It suddenly occurred to me that there is a Sketch Fest THIS Friday! Woah! How has time passed this quickly? Today's update will be brief - we're about to go play outside. New INKtober pieces! I'm caught up through today and have just three to go to make it! It was a lovely weekend. We took it easy, and I got a tremendous amount of Kickstarter work accomplished, did a handful of artwork, and have nearly finished How I Met Your Mother. A grand Duplo tower was built, Jake made the Best Soup Ever, and managed to top that by then making the Best Casserole Ever. I am salivating over the leftovers I get to enjoy this week. These are pieces 22-24 (For sale, $15 each). I'm currently caught up on INKtober! I haven't done today's yet, but it's looking likely I'll ACTUALLY do this! With my good camera. I have about a dozen awesome photos from this shoot, but will you spare you. All for now! Much to do!